The first place I ate at in Oslo was a French cafe/bakery called Pascal. I believe it is a chain, and their website lists several locations. 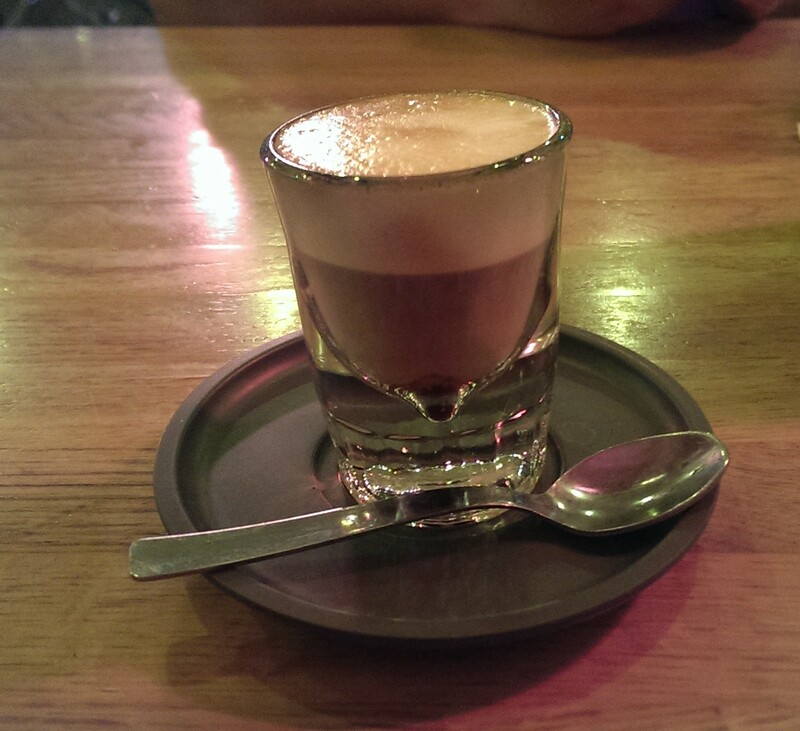 Pacal’s has a pleasant atmosphere with a nice selection of brunch options. Since this was my first meal in Norway, I went for an item in line with the cuisine of the country. This was a fish dinner featuring baked halibut. The halibut was cooked perfectly: flaky without being too rubbery or too dry. It was served over a bed of leeks and potatoes and drizzled with a wine sauce. The combination was absolutely delicious. I think this was my favorite meal in Norway. Pascal seems to be well known for their baked goods. 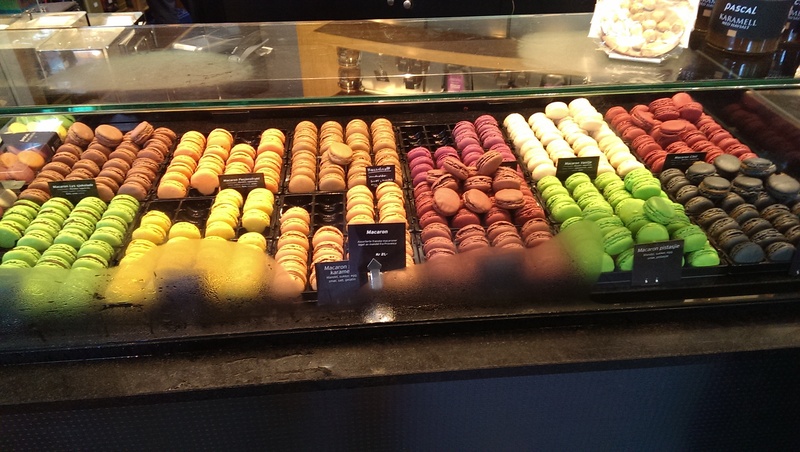 Throughout my meal, people kept coming in and ordering food from the counter, mostly macaroons. The restaurant even had stacks of a book of their recipes proudly displayed at the front of the store. In addition to the macaroons, Pacal also has a varied selection of chocolate moose. I went with the moose, choosing one with peanut butter. This came with a raspberry sauce. The moose was delicious. And the sauce had a strong, but not domineering, flavor that complemented the moose. The raspberries themselves had no flavor; it seems like it had been bleached into the sauce. Still, they provided a nice texture to the dish. A lot of the other diners preferred the smoked salmon dinner. One of them was gracious enough to allow me to photograph their meal. As you can see, the amount of salmon is quite generous. 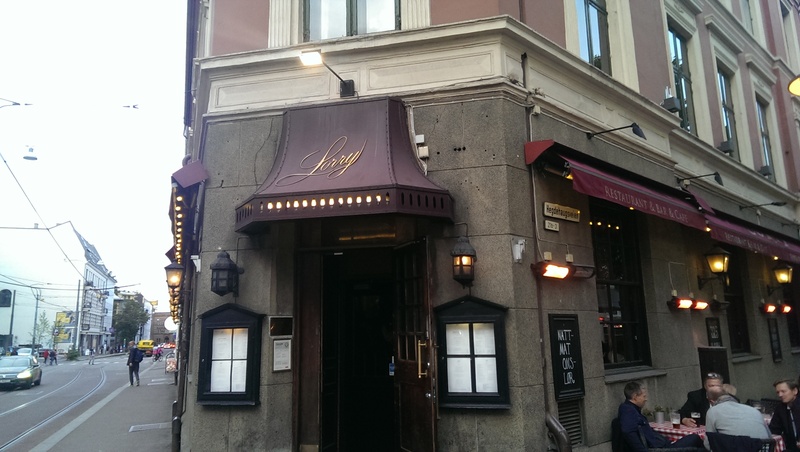 Lorry is a well known restaurant in downtown Oslo noted for serving traditional Norwegian food and for its collection of paintings and other curiosities on display. Unfortunately, my camera battery died and I was only able to get a couple of pictures of the place. So no pictures of what the place is famous for. The atmosphere was relaxing yet classy. It has the vibe of an upscale lounge. And the food lived up to its reputation. I stated my meal with seafood soup; a Norwegian classic. 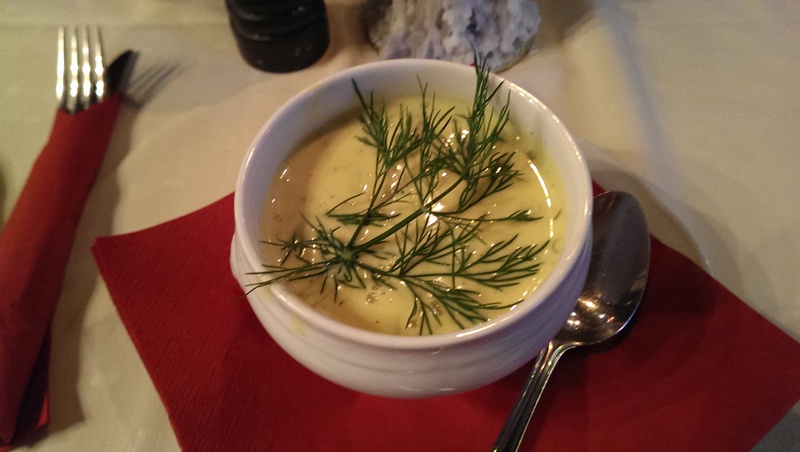 The soup was creamy with a distinctive cheese flavor, yet very light in texture. It was a soup and not a chowder. While not loaded with meat, it had plenty and made for a nice start to the meal. For my entree, I went with another Norwegian speciality: reindeer burgers. This was not served on a bun, but on top of a plate of vegetables and with a berry sauce (a traditional Norwegian accompaniment). The burger itself I did not care for: it was too lean and gamy. Perhaps more sauce would have compensated. But the vegetables were cooked perfectly; very crisp but still tender. For dessert, I went with another dish Lorry is famous for: apple cake. This was actually more like a dense apple pie with thick chunks of apples. It was delicious. 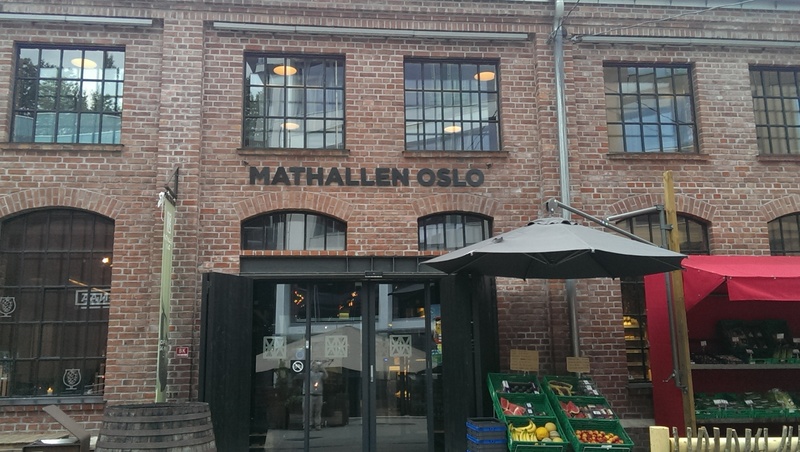 On the recommendation of a friend, I went to diner at an upscale supermarket, Mathallen Oslo, located in the Vulkan District. 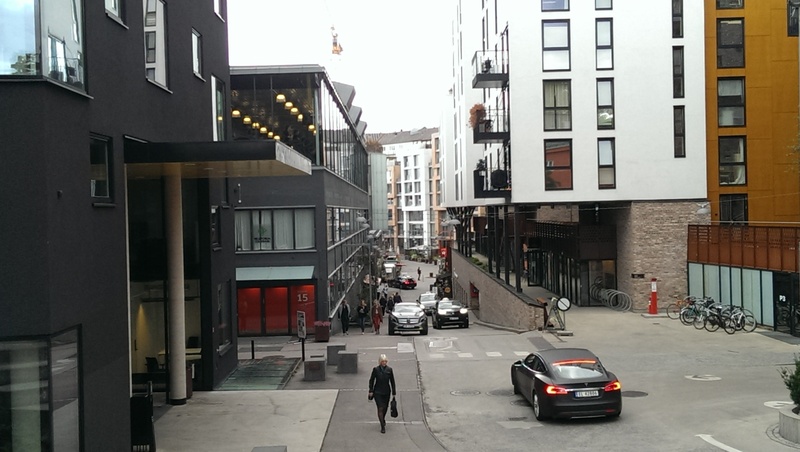 Vulkan is a mixed use development in a former industrial area about a 20 minute walk from downtown Oslo, along the western bank of the Akerselva river. The supermarket is most comparable to a Whole Foods but with restaurants (and bars!) throughout the place. Any type of food imaginable can be found: Italian with fresh pasta, Italian pizza, Portuguese, Asian noodles, Asian street food, Japanese Bento, Hungarian, Mexican, Spanish or Asian tapas. Even gelato! 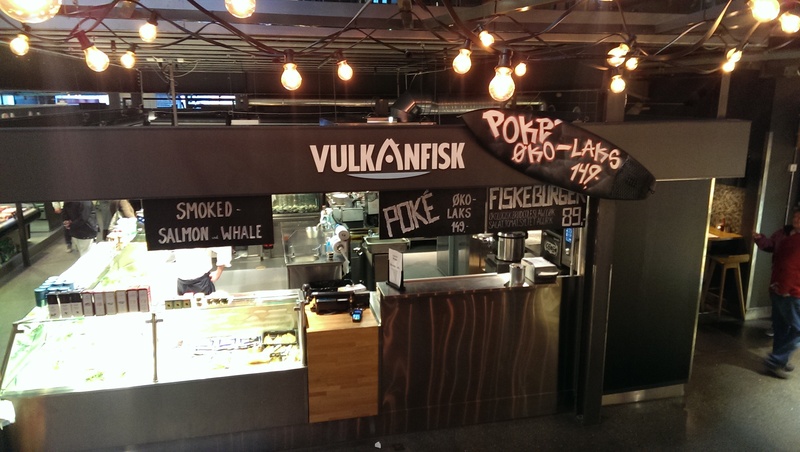 For my meal, I went to the restaurant attached to the local fish monger, VulkanFisk. They serve up dinners made with fresh fish from the counter. 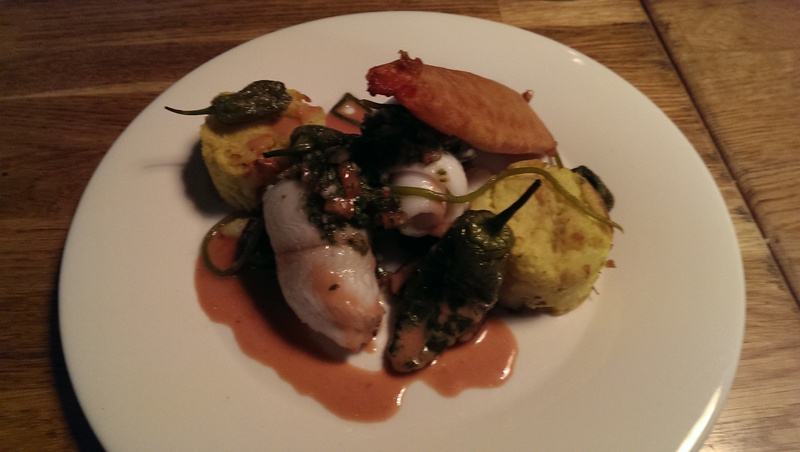 I had the meal of the day, which was cod served with roasted jalapenos, a deep fried chili pepper, and some corn meal cakes. It was perfect. 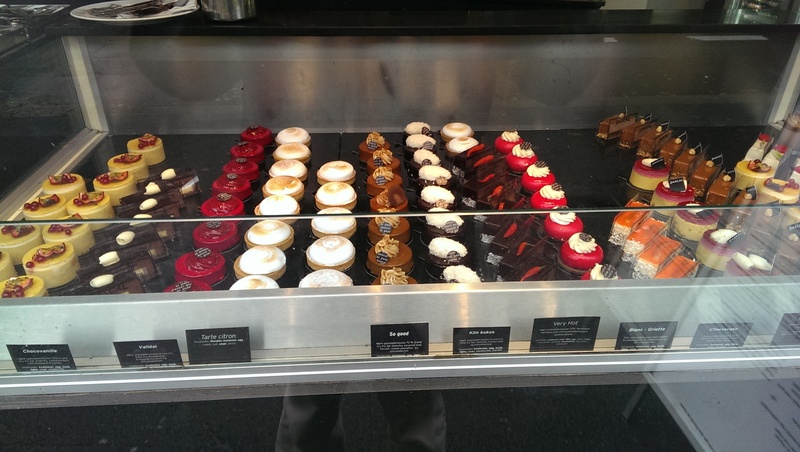 Faced with so many choices, I ended up having three deserts: gelato, a cupcake, and a fig tart. 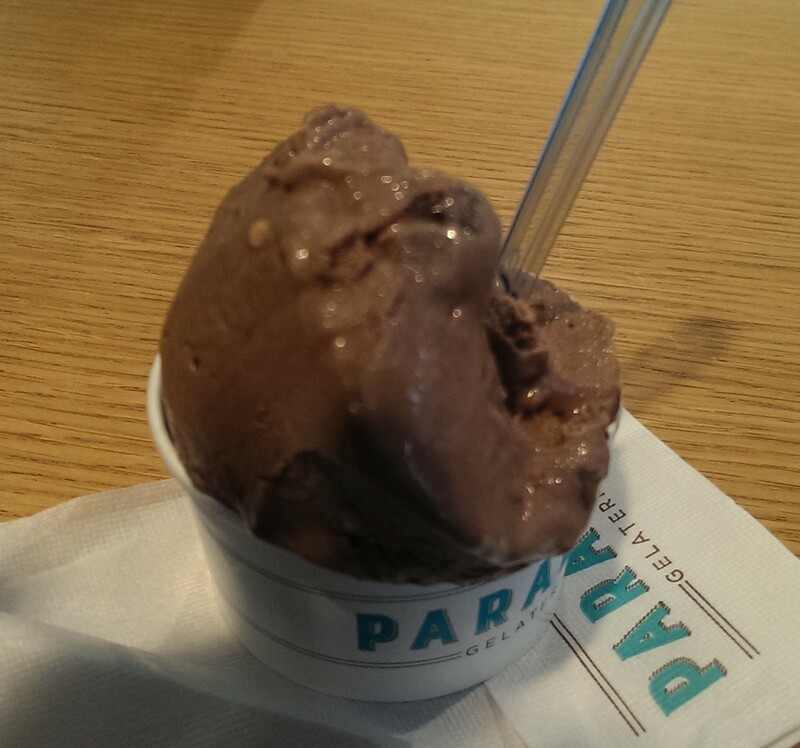 The gelato was a bit of a disappointment: it had the right texture but tasted like it had been sitting out too long. 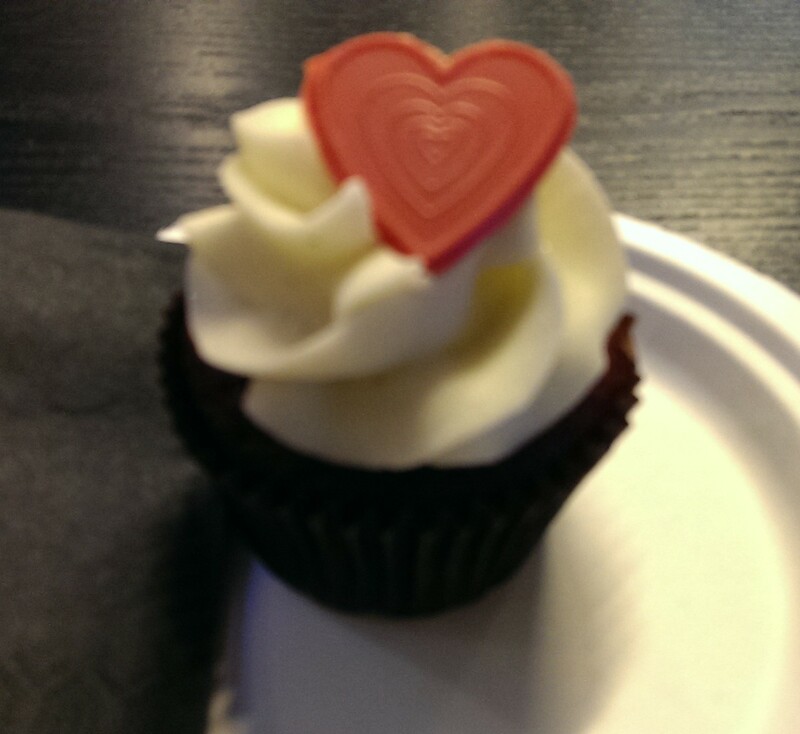 But the cupcake was good, a well made Red Velvet. 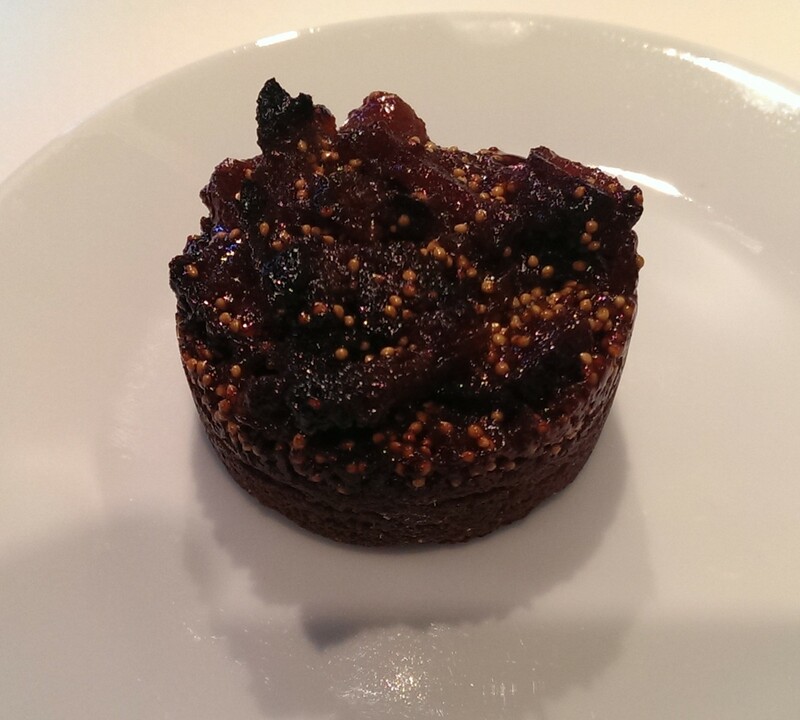 The fig tart was dense and flavorful. 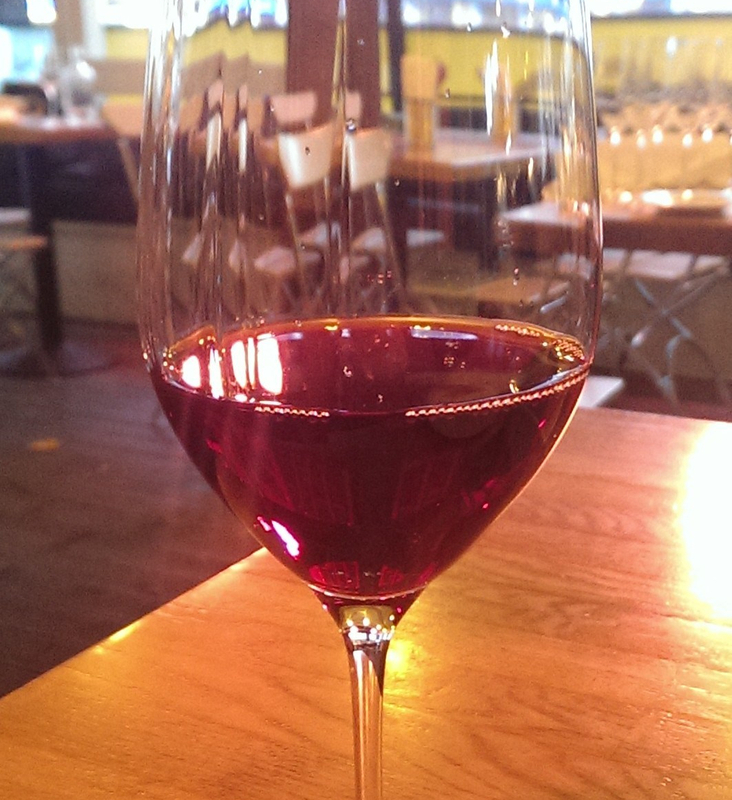 To accompany it, I had a glass of port and that was fantastic. One evening, I joined a friend at an Italian Restaurant that had become a favorite of his: Campo De Fiori. This is in downtown Ozlo, not too far from Lorry. 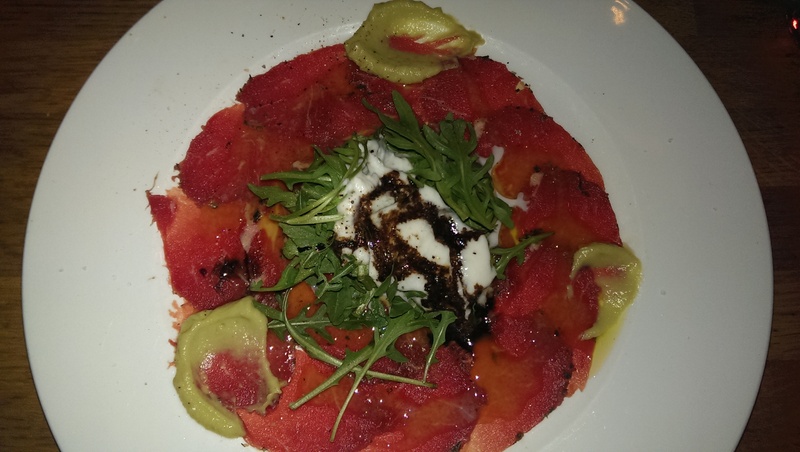 I was not very hungry, so I stuck with an appetizer: a Beef Carpaccio that was simply amazing. 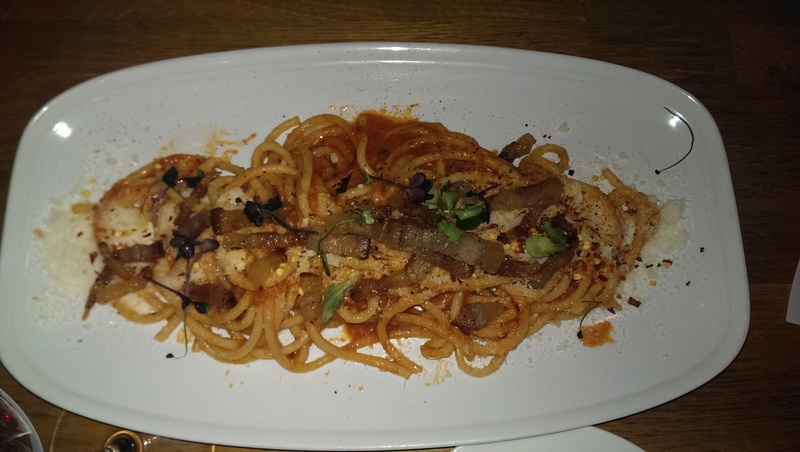 My friend had a pasta dish, Bucantini Amatriciana, that is perhaps the best pasta dish I have ever eaten. He liked it so much, he had it for dinner two days in a row. For my final meal in Norway, I went to another restaurant that came highly recommended. Rorbua Akeer Brygge is a seafood restaurant along the downtown waterfront, near the Oslo city hall. It has a great atmosphere, really conveying the feeling of a shipyard. Rorbua is known for its smoked seafood platter which has everything from salmon to whale. It’s a very big platter, and I probably could have made a meal out of it. However, that would have been a very meat heavy meal. So I ordered an entrée instead. This was oven baked salmon, served over a bed of cooked vegetables. For dessert, I had the “Lofoten Girls“, a small layered trifle. 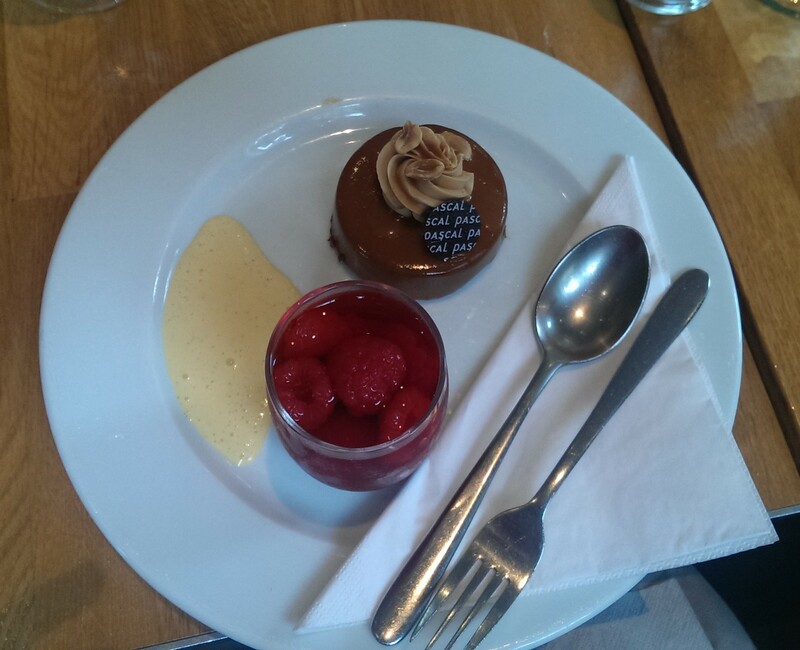 Both the meal and the dessert were quite good. The people at the table next to me did order the seafood appetizer, and it looked fantastic. I hope to try it someday. The restaurant can get quite busy, so I recommend either making a reservation or arriving early in the evening. Oslo has more to offer than just restaurants. Good pubs seemed to be around every corner. 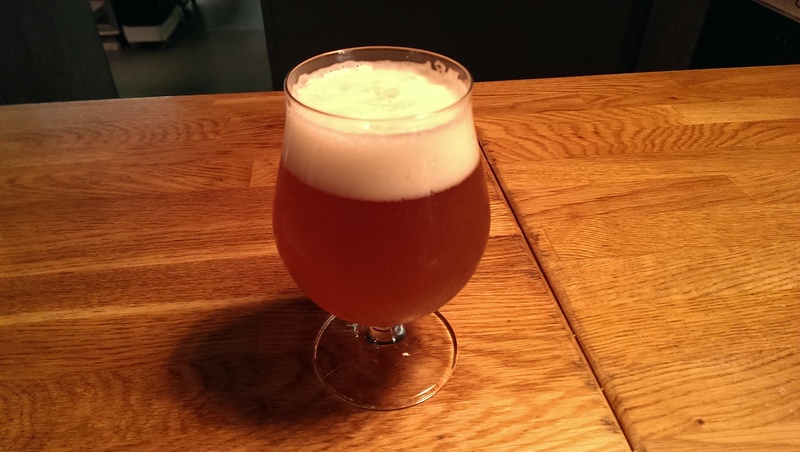 We went to a place called, appropriately enough, the Oslo Microbrewery. 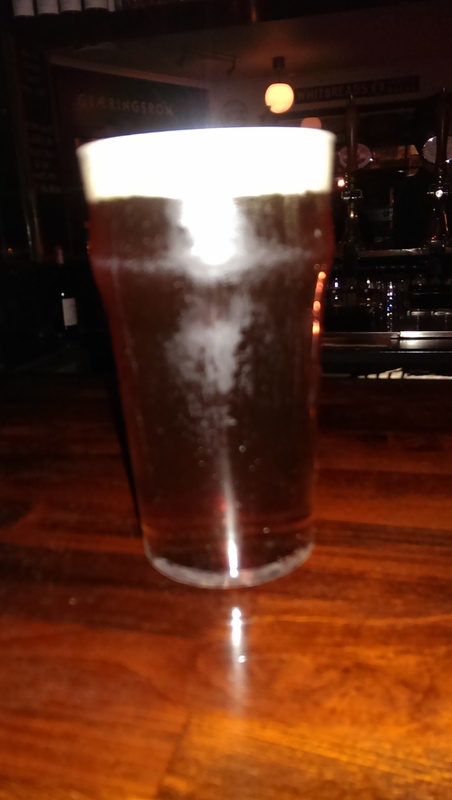 It has the British Pub atmosphere nailed cold. 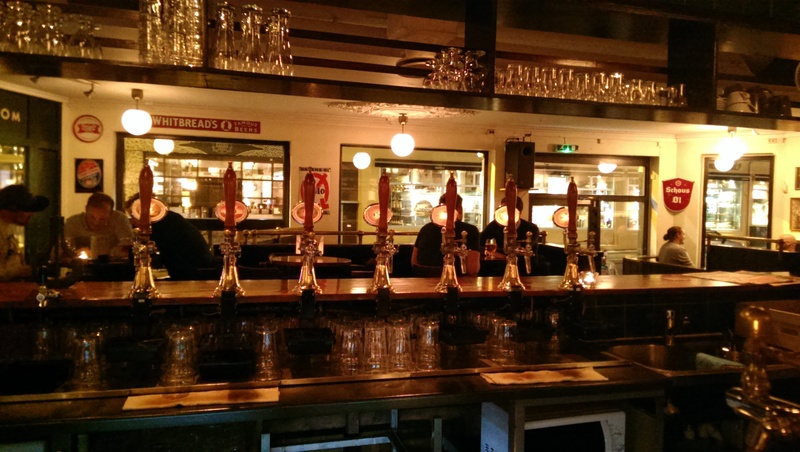 And they serve an amazing array of beers, having everything from stouts to pilsners and copper head ales. I went with the copper head and was quite happy with the results. 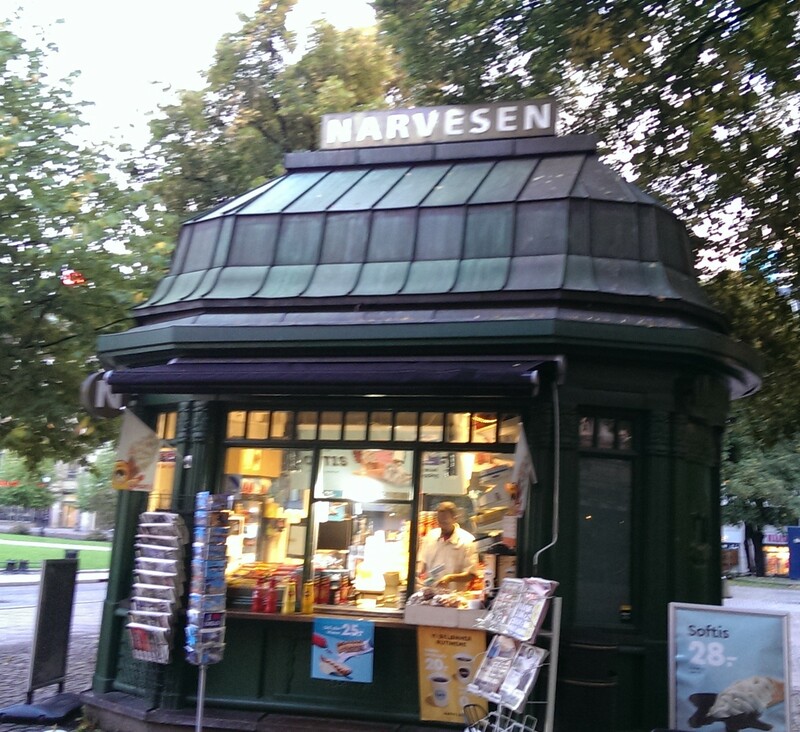 It should come as no surprise that Oslo has a very active food truck scene. What did surprise me was the breadth of what is offered. I saw food trucks with everything from French Crepes, to Greek gyros, to Japanese takoyaki (grilled octopus balls). Takoyaki is a typical Japanese street food, but not something I expected to find in Norway! Almost as surprising was that TGI Fridays was present with an ice cream food truck. Most of the food trucks I saw were at the City Hall plaza on Friday evening. Live music was music playing, and later in the evening a movie was shown. I don’t know if they do this every Friday, but I highly recommend checking it out. 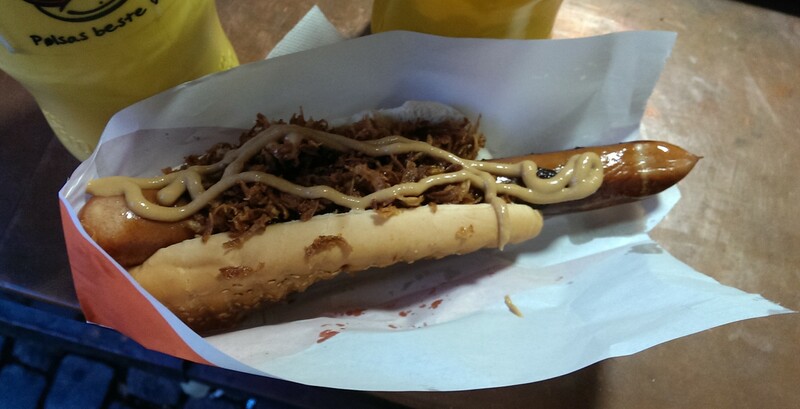 While I did not get it at a food truck, Norway is also known for it’s hot dogs. I got one from one of the ubiquitous newsstands. I’ve mentioned a couple of times on this blog that whenever I travel someplace new, I like to pick up a local cookbook. I find it is a nice way to get a flavor of the local culture. The book I got is Ina-Janine Johnsen’s Mat Pa Bordet Hver Dag (“Food on the Table Every Day”). Johnsen is a popular food blogger in Norway. The subtitle of the book translates as “Dinner suggestions and cooking tips for the busy ones”. While I saw the translation long after I bought the book, that was the sense I got of it when I was browsing in the store. These are simple recipes, each one beautifully photographed, that you could make any day of the week. For instance, there is a simple fig salad recipe composed of green leaf lettuce, figs, blackberries, prosciutto, and walnuts dressed with a simple vinaigrette. The book is divided into sections corresponding to recipe types, such as Salads, Soups, Bread, Pasta, and Casseroles. It looks like a fun recipe book, and I cannot wait to try some.